Given that the family moved to Sheppey, I would think that maybe he was on the permanent staff in with the 5th or 6th. A lot of old regulars being mobilised in August 1914 were discharged as unfit, also there was a chronic shortage of NCO's with experience. Also while soldiers were in either battalion they were being moved around to various Command Depots (Sutton Coldfield, Shoreham, Tipperary) or various Garrison Home Service battalions (Northants, Bedfords, Devons etc), Convalescent homes and so on. On 1/1/16 the 5th had 1,552 Rank and File, 28 Buglers, 122 sergeants, 20 W.O. 's & 67 officers. On 1/1/16 the 6th had 1,410 Rank and file, 24 Buglers, 106 Sergeants, 3 W.O. 's, 88 officers. To add to this they had various numbers in Sutton Coldfield, Shoreham & Winchester. On 1/1/17 the 5th had 2,388 Rank and file, 13 Buglers, 142 Sergeants, 22 W.O. 's and 98 officers. On 1/1/17 the 6th had 2,194 Rank and file, 10 Buglers, 110 Sergeants, 27 W.O. 's and 81 officers. To add to this troops at the 47th Base Depot, Depot at Winchester, and with the onset of the Training Reserve Battalions troops with the 108th, 109th, 110th, 111th & 112th TRB's. On 1/1/18 the 6th had 1,346 Rank and file, 12 Buglers, 113 Sergeants, 23 W.O. 's and 151 officers. To add to this troops at the Base Depot, depot at Winchester, 51st Graduated, 52nd & 53rd Young Soldier battalions. The lack of a Medal Index Card or records, and with the family moving to the Isle of Sheppey seems to indicate he never served overseas (I stand to be corrected if one can be found) but I have run through the Smiths in all the Regular battalions with all the Smiths having different middle names. The British War Medal/Victory medal roll usually gives the middle name if there is none on the MIC. Then we come to the B Prefix, a lot of these were old soldiers and discharged as being unfit. The S Prefix also has a lot of old soldiers, a lot discharged due to fitness also. The P Prefix has a lot of North London men and an awful lot of soldiers being discharged as being underage. Etc., Etc. Would he have re-enlisted under an alias. As an example please see attached page from 5th RB for October 1917. Also if we admit the possibility that Arthur Meadows Smith may have been known as plain "A. Smith" with no middle initial, then any of the many "A. Smith"'s in the four Regular battalions who were discharged with Silver War Badges would almost certainly have preceded their discharge with a spell at 5th or 6th battalions in the Sheerness area or the Rifle Depot at Winchester. ... and of course a returning Regular reservist could have been posted into the Service battalions as an NCO to 'leaven' the Kitchener volunteers. Thank you Andy & Mark, your feedback has been excellent and very much appreciated. 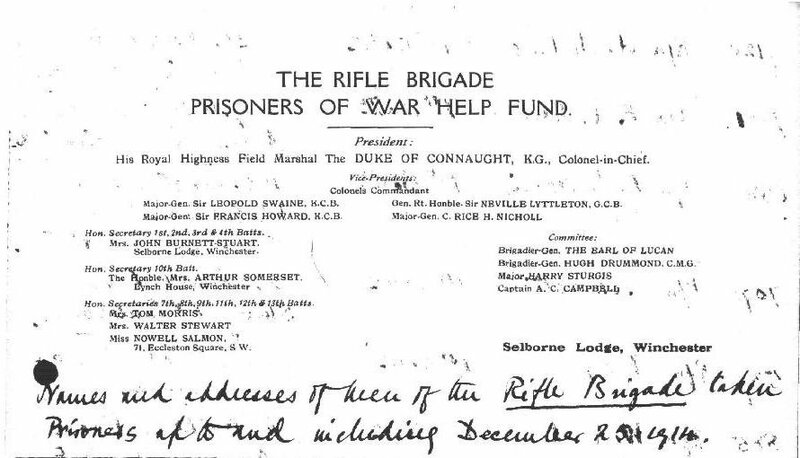 One last question, did the Rifle Brigade have any connection to Cambridge during the war years, the reason I ask is my grandfather mentioned that he lived for a short while in Cambridge as a child, I have struggled to find out if this is fact or fiction. No Official ties to Cambridge. The 3rd RB spent a small amount of time there with the 6th Division whilst it concentrated in the area and conducted some training. 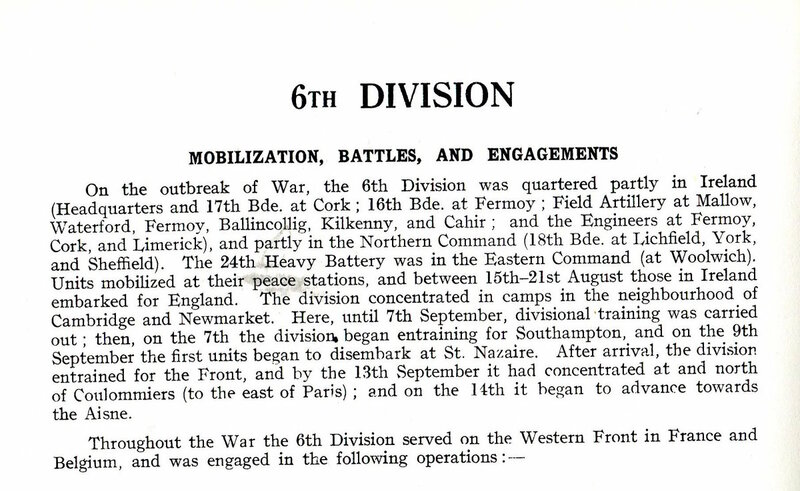 04.08.1914 Stationed at Cork as part of the 17th Brigade of the 6th Division then moved to Cambridge and afterwards on to Newmarket. 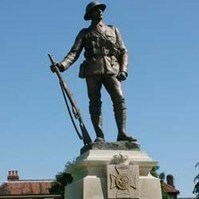 04.08.1914 Stationed at Winchester at the outbreak of war and then moved to Sheerness, Isle of Sheppey and remained there until the end of the war. 6th Rifle Brigade were never at Cambridge, they spent the whole war on Sheppey as a reserve Battalion and part of the South Thames Garrison. The 3rd Rifle Brigade were part of the 6th Infantry Division. The whole Division concentrated around Cambridge and conducted some training there. The 3rd RB were at Cambridge less than a month. My grandfather has done a good job in confusing me with his tales, Harrow or Cambridge, stick or twist! 1st or 3rd Bn or 5th/6th, guess we will never know. Although I have managed to trace some of Arthur's grandchildren and will be writing to them soon. 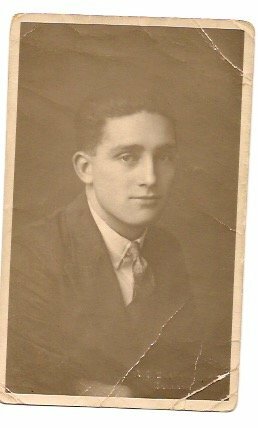 I've attached a photo my Aunt found in my grandparent's collection, 90% certain it is Arthur Smith. Thank you once again for all your feedback. Let us know if Arthur's grandchildren come up with something. The photo is confirmed as being Arthur Smith, it was taken by well known photographer based in Sheppey, L. G Mason. 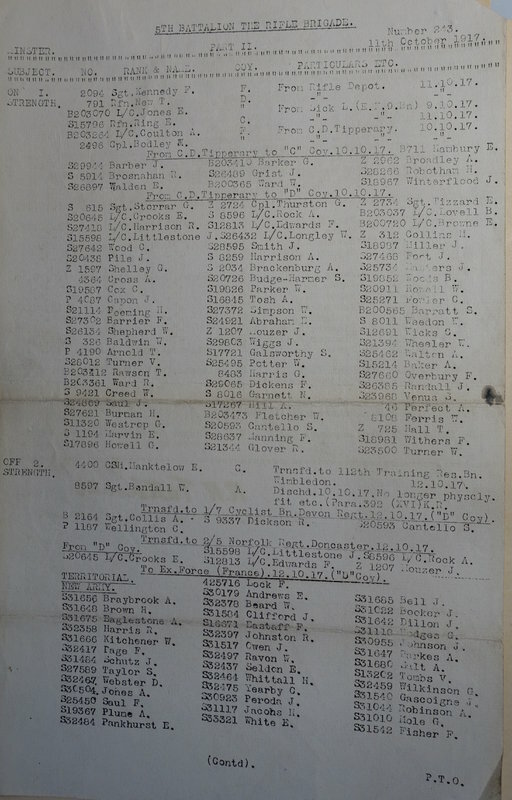 I have just gone through all the RB POW's for 1914 from the Rifle Brigade Prisoners of War Help Fund which lists the address and numbers of all taken POW in 1914, the Smiths listed are not Arthur M and all the address listed are UK. Is there any proof he actually served overseas during the war or kept on Sheppey as a drill instructor or some other role?? Would it be possible to view the list of addresses and service numbers you mention. Prior to the commencement of WW1, Arthur Smith was living in New Maldon, Surrey and before that Kingston upon Thames. Sorry to cut in to this topic but it is similar to a subject I am looking into and didn't know whether to start a separate topic. I have been lucky in finding his service records so I hope it might add to the info already given. He attested in January 1903 to the Rifle Brigade for 3 years + 9 reserve in Jan 1903 No 9556 serving with the 2nd Battalion in Egypt and India during which he extended his service. he was returned to the Reserve in 1910 in Hollywood ,Belfast. During this period he worked in the shipyard and also as a waiter and married a local girl and had there first child in 1911. In 1913 he applied to reside in South Australia and was granted permission to serve with the Australian forces, leaving his now pregnant wife and child in Belfast. How would this arrangement work? and presumably the army provide the transportation. He was mobilised with the Australians in 1914 and served with them until 1916 when his engagement came to an end. Funnily he would be required to pay his own transport to return to England. However he attested with the Australians in Jan 1917 and served with the 10th Battalion 24th reinforcements No.7371 with substantive rank of sergeant returning to England and then France being wounded in June 1918 on return from injury moved to permanent staff and returning to Australia as CSM in 1920 with his wife and two children. Again would this transportation be provided by the Army as I cannot find any passenger list? Hopefully this might help with Service Nos and timeframe. Afraid I can't help, Andy is the expert. I've often wondered if Arthur Meadows Smith ended up in Australia. My grandfather mentioned once that there are Meadows Smith's out there. From the research I've done, I can only assume he was refering to Arthur. I've never considered the idea that after the war he might have transferred to the Australian forces, so you have kindly prompted me to consider this. I found the National Archives of Australia (NAA) and Australian War Memorial AWM useful.